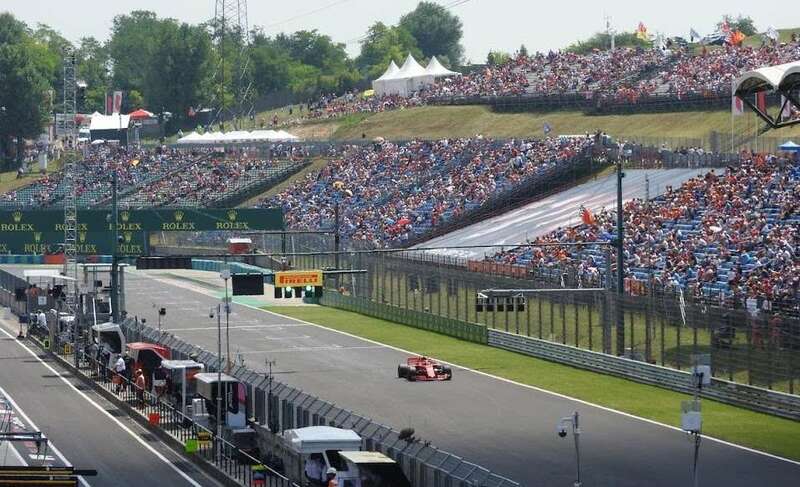 Your guide to buying tickets for the Hungarian Formula 1 Grand Prix. 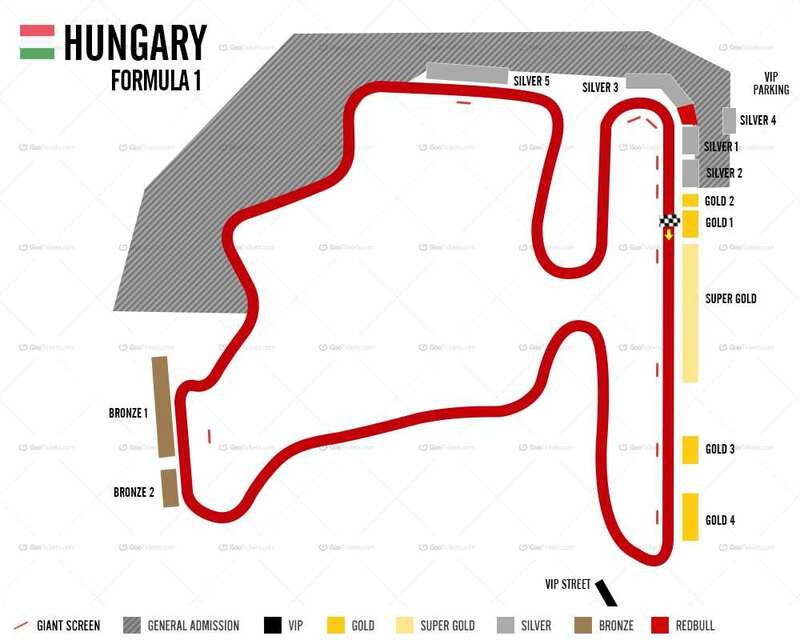 Where to sit and where to watch the action at the Hungaroring on August 2-4, 2019. 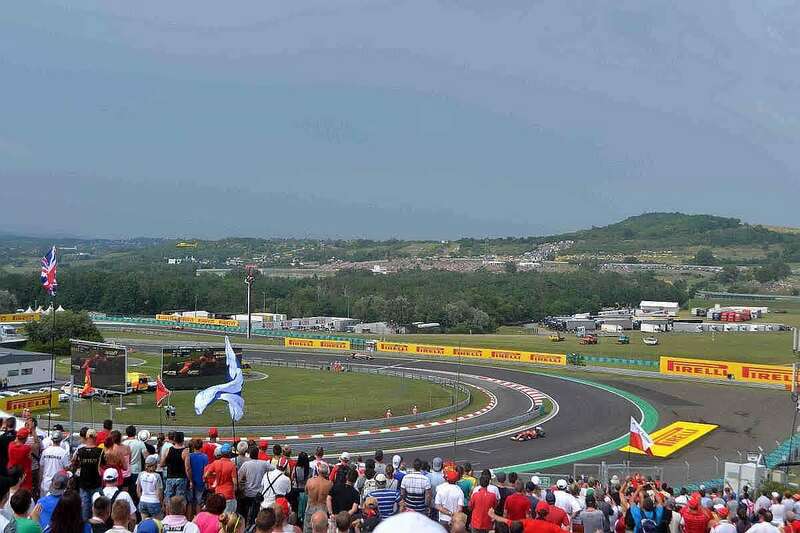 Held outside Budapest at the height of the European summer, the Hungarian Grand Prix offers excellent spectator viewing and a laid-back atmosphere with easy access to one of the continent’s finest cities. It’s also by far the cheapest European race, with three-day grandstand tickets for as little as €76 (including early-bird discount) and free entry for children under the age of 14. Prices remain steady for 2019. The only significant change for next year is the addition of more options for the popular “Three Corner” packages, where you sit in a different grandstand each day. The Editor attended the 2018 Hungarian Grand Prix. All pictures © f1destinations.com. Ticket prices are reduced by up to 20% until December 31, 2018. Support the development of this site by buying your F1 tickets from our partners, Gootickets. We receive a small commission when you buy using the links on this page. We don’t apply any markup, so you’ll always pay the cheapest price! We also recommend Official Ticket Packages from F1 Experiences. Best cheap grandstand? You can’t go wrong with the Bronze 1 and 2 grandstands, which represent excellent value (the views from Bronze 2 are better). Best mid-priced grandstand? All five grandstands clustered on the hill around the final turn 14 (Silver 1-4 and Red Bull) offer excellent views. Silver 4 has the most elevation and tends to sell out first. The Red Bull grandstand on the apex of the corner is also popular. Best higher-priced grandstand? Gold 4 on the entry to turn 1 is the best of the Gold grandstands, but it’s uncovered. The only grandstand that will keep you out of the hot sun at the Hungaroring is Super Gold. Worth considering! The majority of tickets on sale for the 2017 Hungarian Grand Prix are 3-day tickets. Race day (Sunday only) tickets are also available at a discount of approximately 10% to the 3-day ticket price. All grandstands at the Hungaroring have numbered individual bucket seats and a large TV screen opposite. Parking at the circuit is free for ticket holders. There are also regular buses from the city center to the circuit on race weekend. Learn more in Getting Around. The most expensive Super Gold grandstand (on the main straight opposite the pits) is the only covered grandstand at the Hungaroring. If you don’t fancy spending three days in the baking hot sun, this is your grandstand. The grandstand hopping offer is good for first-time visitors to the Hungaroring who would like to check out some different corners at the circuit. Six different grandstands are included in the three grandstand hopping ticket offer for 2019. The packages takes their name and pricing from where you site on race day. Get unrivalled behind-the-scenes access at the Hungaroring with F1 Experiences! Official Ticket Packages include grandstands or access to Champions Club hospitality plus exclusive benefits such as opportunities to meet drivers, guided Paddock Access and more. Much like the Circuit de Barcelona-Catalunya, the Hungaroring is situated in a natural amphitheater. This means that the General Admission areas offer excellent viewing opportunities, especially between turns 9 and 14. Many of the grassy GA areas are located on higher ground behind the grandstands (particularly at turn 14) so whilst the view is often quite distant, you still get the opportunity to see large swathes of the track, as well as the big TV screens for the grandstands (bring binoculars so you can follow the action). At just €90 for 3-day tickets (€72 with early-bird discount), these are some of the best value General Admission tickets on the current F1 calendar. Bronze 1 is an excellent value grandstand. Worth it for the numbered seat and the view of turn 5, a fourth gear right hander taken at around 220km/hr. Bronze 2 is the better of the two Bronze grandstands. You’ll have a decent view of the cars taking turn 6. The disadvantage of the Bronze seats in general is that you have a long walk to the hub of the action and F1 village behind the main straight grandstands. Silver 1 is the smallest of these grandstands, offering 1900 seats close to the exit of turn 14. As well as a ringside view of the circuit’s final turn, you’ll also get a distant view of turn 12, the pit entry, pit straight and back of the grid for the race start. Silver 2 is a little further away from the final corner, closer to the pits. This grandstand is good value compared to the Gold grandstands further along the pit straight. On the downside, views are obscured by the advertising banner across the track. Silver 3 wraps around the final turn 14 bend. Depending on where you sit, you will have a better view of turns 12-13 and pit entry or the exit of turn 14 and up the pit straight. As with all the Silver Grandstands (apart from Silver 5), this is a solid choice for a first time visitor to the Hungaroring. Silver 4 is set further back from the circuit behind the Redbull grandstand. With greater elevation than the other Silver grandstands, Silver 4 provides an excellent panoramic view of turns 12-14 and the pit straight. Recommended. Redbull Grandstand is right in the middle of the cluster of grandstands around turn 14. Located between Silver 1 and 3, you’ll get a distant front-on view of the straight between turns 11 and 12, as well as the final two corners and along the pit straight. A good choice, not only for Redbull fans. Silver 5, located on the short straight between turns 11 and 12, is the cheapest grandstand in this category. From the higher rows, you will also have a distant view from turns 9-10 through to 13-14. If you can afford it, we recommend paying a little extra for any of the other Silver grandstands (or Red Bull) instead. Super Gold (video above) is the only covered stand at the Hungaroring; good for keeping out of the hot summer sun! Super Gold is located across from the start-finish line, top teams pit garages and podium. Great seats for the race build-up and start, but you won’t see much in the way of on-track action. Please note: There are two categories of Super Gold, Gold 1 and Gold 2 tickets: seats in rows 1-12 are cheaper, because views are obscured by the catch fencing and you cannot see over the high pit wall at the Hungaroring. Buy the more expensive seats if you can! Gold 1 is located on the pit straight, opposite the pits of the top teams and next to the start/finish line. This grandstand is good for pits action and the race start, but go for the similarly priced Silver 1-4 if you want to see more on-track action. Gold 2 is good for pit action from the top teams, the race lead-up and start. You’ll also get a view of the cars exiting turn 14. Gold 3 is located on the pit straight, closer to turn 1. It’s good for the race start and pit exit, but not much else. We don’t recommend Gold 3. Pay a bit more for Gold 4 on turn 1, or save some cash and buy a seat in one of the Silver grandstands on the last turn. Gold 4 (pictured below) is definitely the pick of the Gold Grandstands. It’s located before turn 1, the best overtaking spot on the circuit. You’ll also get a great view of the race start and be close to the F1 Village behind the main grandstands on the pit straight. Highly recommended. 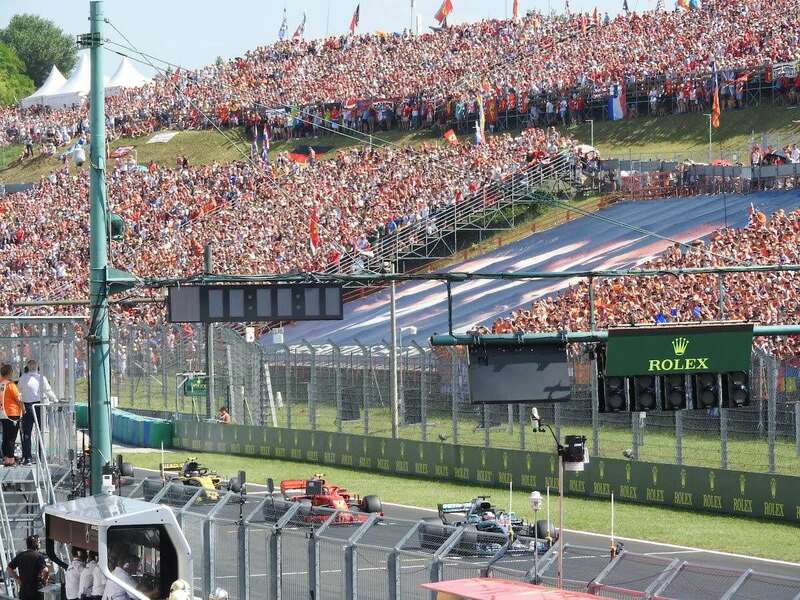 Do you have a favourite grandstand at the Hungaroring? Leave a comment below! Hi, we sat in Gold 4 in 2015 with Gootickets. We were on in Section K Row 9. This year we’d like to be left and higher. Can I ask fro your video https://www.youtube.com/watch?v=ceH9hZxWVJY what your exact seat section was and who provided it as many providers get bulked in the one area. We’re looking for section C or D and quite high to see the action once around the turn just like the video. Hi Jason, thanks for getting in touch. Honestly, I am not sure of the section. Back in 2014 when this video was taken, they still had Free Friday at the Hungaroring, which meant you could sit in any grandstand you wanted on that day (didn’t have it last year, trying to find out right now about 2016). For tickets, we bought via the official ticket agency for the event – GPTicketShop – they should have the best selection of tickets for Gold 4. Good luck and enjoy the race, maybe we will see you there! Speaking of the rows Andrew! This year I will be on the first row of gold 1. Does this mean I am at the row closest or furthest from the track? Hi Philip, I believe row 1 will be closest to the track, but I will double check and let you know! Jason, when you say left and higher , what section would that be? As planning my first Grand Prix this year in Hungary as part of my Birthday treat..
Ah Just saw the c or d comment, how can you actually specify which seating you want? Hi Mark, yes you can buy tickets at the track on Sunday. There’s a ticket booth near turn 1 entrance, open from 7am to 2pm. We had super gold tickets for the 2015 gp, and if you’re into the whole pit strategy part of the race, these seats are great. Does anybody know if you have access to the GA areas with a gold grandstand ticket in Hungary? Hi Thomas. Yes, you have access to all the GA areas if you have a grandstand ticket (all grandstand tickets offer GA access). I am not a huge fan of the pit straight tickets, but yes, they are good for the pit strategy (plus start/finish). I prefer the final corner grandstands personally. is there a free friday this yeaar? We went to Budapest last year for the GP, and had a Gold 3 corner ticket – really good value, got to see a lot of the track, and being on the start/finish on race day was excellent. Wish other tracks did it. Thanks Kirsty, good feedback! That’s got us inspired to do some research into an article on circuits that offer 3-corner tickets. Cheers! Does anybody know where we can see a plan of the sector of each tribune? Hi Dan, I’m not sure such a plan exists online. You could ask GPTicketshop directly, as they are the official tickets partner. Me and my son have got Row 20, Section 4 in Gold 4, think this is near the top which should be fab. How long is the walk from the shuttle bus? 1/2 hour? You’ll have a great view from those seats! I’ve never taken the shuttle bus myself, but it will probably be at least a 30 minute walk. If your legs are tired, I think you will find a taxi for that short distance as well. Hello! Can’t wait for the weekend! Question: I only can see that it’s free parking with a grandstand ticket. Googled it, checked all the FAQ’s but just can’t find it. What about the general admission ticket, can i park for free or can i get a ticket somewhere? Thanks in advance! Hi Chris, FREE parking for all ticketholders. I cannot remember any checks whatsoever, so probably you could park without a ticket as well. just turn up and park! Doy know if we can enter wih flags? I mean i am a little bit concern for the pipe holder of the flag. Is there any problems with the security. And also do you know which gates they open after the end of the race to step foot on the track? Hi Ivan, you should be fine with the flag, but I cannot guarantee. I think they open gates at the final corner, main straight and near turn 1 to let you on to the track after the race. Enjoy! Hi, there seems to be a huge difference in price between the Super Gold (rows 1-12) tickets and the cost of just Super Gold tickets. Is it just because you do not have a good view of the pits if you sit from row 1-12? Hi Ellie, that’s pretty much correct. The pitwall is quite high in Budapest, so below row 12 you can’t really see into the pits. You will also have the catch fencing getting in the way. Hello! I also have a question regarding seats. If you buy a ticket for the Bronze seats, do you also have acces to “General Acces”? This is just in case we want to take a walk and see other corners. Thank you in advance! Hi Gina, yes you do! It’s a good idea to buy the Bronze seats so you have somewhere to sit for the race. The rest of the time you can wander around the General Admission areas. Enjoy! I was about to buy the Bronze 1 ticket when I found your site. You seem to recommend the Bronze 2 over B1 as a better option. My logic would say that we would have better view of the cars taking corner 6 instead of seeing the cars going in a straight line. What would be your main reason for the Bronze 2 seats? Hi, I don’t really have a strong preference for either Bronze grandstand. They are both outstanding value, the cheapest grandstands at a European Grand Prix. I had a feeling that’s the case. I will flip a coin then :) Thanks for the quick response! Christmas present sorted! Buying tickets from gpticketshop.hu for 2018. It says that tickets can not be posted outside Hungary, is this normal? Is this the official seller? Hi Dave, seems a little strange. Gpticketshop.com is the official seller, I’m sure they post outside Hungary. Or buy for the same price with Gootickets. I was redirected there from http://www.hungaroring.hu, do you think it’s a doggy website then? This seems like a big think to alert people about if it is a scam. Visited their Facebook account and it’s hungarian or poor English. Not getting a good vibe from them. Where is silver 6 grandstand, I don’t see it anywhere on the map? I’ve booked tickets for silver 5. Will they allocate our seats or is it sit anywhere within the silver 5 grandstand. Will they sit us together? Hello, you didn’t state where you bought the tickets from, so I cannot answer your question. Please contact the ticket agency where you bought the tickets. Hi, I bought tickets for the Red Bull stand this year. I just received them by post and we’re seated at section A, row 27. Do you by any chance know where section A is located on the Red Bull tribune? Sorry Nikki, I’m not exactly sure if section A is closer to the start/finish line or the other way around. Row 27 should be quite high in the stand. Either way, I think you’ve chosen a good place to watch the action at the Hungaroring! Hi there. Firstly, thank you very much for the website, which has so far been an informative and useful one-stop shop for me. In the last few days I’ve bought a (3-day) ticket in Silver 2 from Gootickets. However, I also noticed (before buying) that GPticketshop (the one you’re directed to from the official Hungaroring website) is instead showing all Silver grandstand options (except Silver 6 I think) as sold out. Therefore, is there a risk of my transaction “bouncing” due to lack of availability? And, if so, when am I likely to be informed of this? Any steer/advice you have is welcome. If you’ve paid for the tickets, you have nothing to worry about. Gootickets is the same company from Monaco (Platinium) that supplies official F1 Tickets. They get allocations for each race, so I guess they still had tickets available when they sold to you. Enjoy the Hungarian GP! we bought 2 tickets for Gold 1 Rows 1-12 for this year’s GP. Does it mean that I wasted more than 500€ for nothing, as I won’t be able to see anything from there? Chris, not sure what you mean about “Formula 1 village.” If you mean the F1 Fanzone behind the Main Grandstand, then anyone can go there. If you mean the F1 Paddock behind the pits, then access there is very restricted. F1 Experiences does offer some packages with access to the F1 Paddock. Please email me if you want more info about this. I have just received our tickets for Hungarian GP. The seats are in Red bull corner, section J, row 1. Are they OK? Not sure about section, but row 1 is probably at the front. Not the best, as you won’t have so much elevation to see more of the track. Red Bull is an excellent grandstand! Hi, We have bought tickets for Bronze Grandstand. Just wondering if the seats are numbered as it looks like benches in the pictures? We have a 2 weekend silver ticket? Is it allowed to take my wife on saturday training and my daughter on the sunday race? I’m not sure. Please check Terms & Conditions here. Is it possible to buy tickets at the track for sat and Sunday?? Thanks, great site. Hey. If I’m buying the ticket from Goo tickets can I choose my seat and row? Thanks. No, but you can request in the booking and they will try to get you what you want from their allocation. Hi, I am worried about buying the tickets early as the dates are provisional. are they likely to change? Hi Alex, the dates for the Hungarian GP are highly unlikely to change, but if you want to be on the safe side, you should wait until October 12. This is when the FIA World Motorsports Council will meet to approve the 2019 F1 calendar. Thank you, its more surrounding the airline tickets. There could be many reasons why an event date changes, but the Hungarian GP has not had a significant date change for a long time. Hi, was thinking of getting my partner tickets for 2019 Hungary race. Can’t secide between general admission or bronze? What are the different between the two? Do you still get to see enough with general admission, are you able to access the track after the race? Can you access the fan zone with general admission. Hi Heather, just buy the Bronze tickets. The current prices are 76 EUR for 3-day Bronze and 72 EUR for 3-day General Admission. But you get a grandstand seat with Bronze, and you can still go wherever you want in the General Admission areas. So you get the best of both worlds, even if you only use your grandstand seat for the race. I didn’t expect that Kubica’s comeback will bring this kind of problem at the beginning of december :) Thank you in advance. Hi Mario, I’m afraid the tickets are already sold out (to Kubica fans mainly!) and there will not be anymore. I like the General Admission area at the Hungaroring, but I guess it will be busy next year. Otherwise, just get a grandstand seat on the last corner. Silver 3 costs only 156 EUR till end of December and it’s a great view from there. Hello Andrew! What do you think, will there be grandstand tickets to buy at race day or quali-day, at the gate or outside the track? Hi, I wouldn’t take the risk, especially if Robert Kubica starts the 2019 season strongly. The Poles could cause a sell out in Hungary! Better to buy in advance. Hi Andrew, i hope it will be my first time at F1 this year. Please tell me, will be general admission tickets available even on june/july? Hi Konrad, I think you should buy the tickets now. If Kubica starts the new season well, I think the race will sell out before June. I’d buy the Bronze 1 or 2 grandstand – the price is only a few EUR more than General Admission, and you will have your own seat to watch the race. You can still watch from the General Admission areas. Pozdrawiam! Sorry about that. I guess most people bought before December 31. Lots of ticket categories now sold out. Sorry Stuart, I don’t know exactly how the wheelchair section in Gold 3 looks like. I suggest contacting the circuit – I’m sure they will reply (office@hungaroring.hu). The one thing I would say is that it gets very hot in the sun at the circuit, so take precautions. Gold 3 is not covered – Supergold is the only covered grandstand at the Hungaroring. Cheers Andrew,I’m waiting to hear from the circuit. As my boyfriend is a big fan of F1 and especially Robert Kubica, I would like to buy the tickets for Hungarian GP for his birthday. This will be our first GP and I am wondering which tickets to buy. I have to choose between 3 corner Red Bull (Gold1,SuperGold,RedBull) or just a RedBull grand stand for a weekend. Could you advise best option? Is the 3 corner worth to buy just to see friday and saturday in Gold perspective? It is almost two times more expensive than just a Red Bull granstand for a weekend and I am not sure if it is really worth it. Czesc Anna! Great idea, I’m sure your boyfriend will be very happy with this birthday present :) I would buy the Red Bull Grandstand – you have the option of paying 20 EUR extra on Friday to sit in another grandstand, and you can also walk around the General Admission areas at any time. The views from the Red Bull grandstand are really good! Great website you have here! I am looking to come to the GP for the first time ever and was wondering about where best to sit. it seems as if only silver 6 is avaiailable now at a price around £170. I can’t find much information about these as i’m presuming its a new stand. Could you give me your thoughts and if it is worth the money or stick with the general admission or bronze stands? Hi Amish, yes Silver 6 is a new grandstand. Not the best location, but all the other Silver ones (good ones on final corner) are sold out. Also Bronze tickets sold out. General Admission is good, but I’d prefer to have a seat for race day and not battle all the other fans for a view of the action!